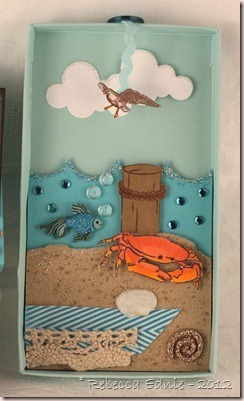 I love the ocean so it was a natural choice for my diorama matchbox! I used a scallop die to make the waves. 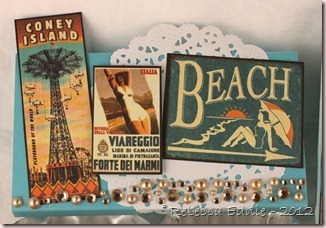 The sand is stamped with kraft ink then stamped again with a glue pad and gold glitter was added. The fish ‘bubbles’ are Dew Drops and the water is glittered along the edge and blinged with rhinestones. The sea bird dangles from a piece of rickrack. The cover features pieces I cut from a Graphic 45 paper pad. Along with a die cut doily and some cool bling! In case you are familiar with a normal 250 ct MB, yes, this is much thinner. I specified that the box be thinner so it would cost less to mail. So it is only 1/2” high. Since I was sending it all the way to Australia, I’m glad I made it thinner! $4.85 vs closer to $10! 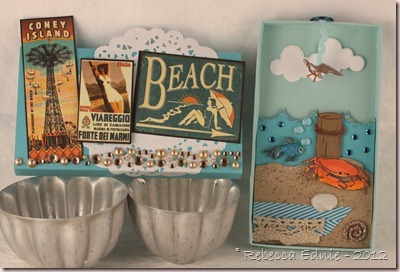 Stamps: crab, post-Shore Treasures CDS, bird-Seashore Crafty Secrets, sand-SU!